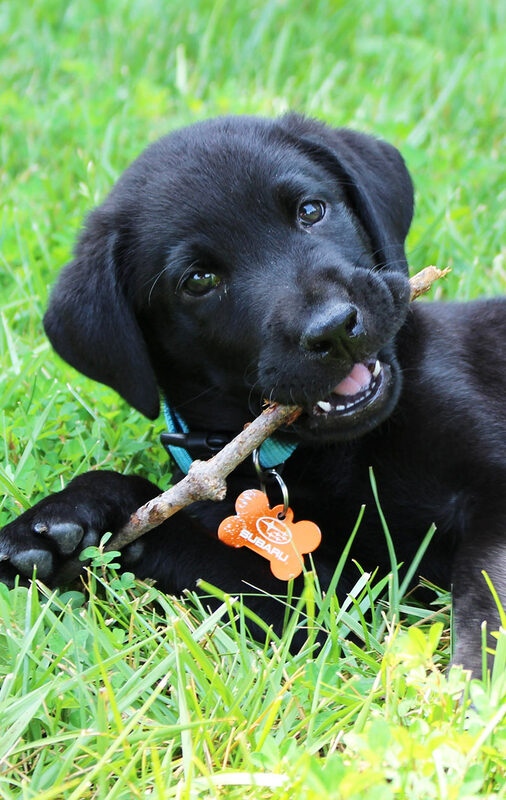 Puppy teething doesn’t have to be stressful. We’ve put together a puppy teething timeline that tells you know what to expect and when; advice on dealing with nipping and chewing; and suggested toys for teething puppies. How many teeth does a puppy have? 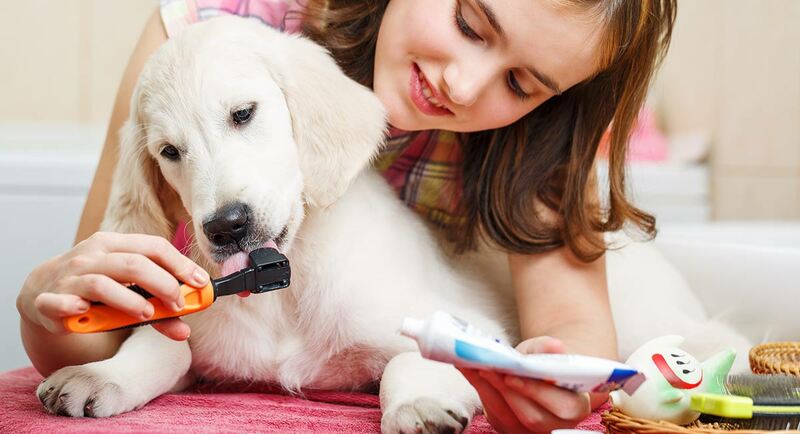 We’ve included a handy teething timeline and guide to puppy dental care. With human babies, we tend to associate teething with sleepless nights and grumpy infants. With puppies, our concerns tend to focus more on biting and destructive chewing behavior. To answer that question, here’s a quick timeline for you to refer to as we go. Birth – no teeth yet! Now let’s dig down a little deeper. 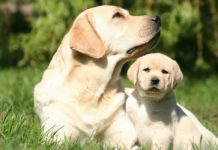 In this article we’re going to look at the facts and fables that surround the question of teeth and teething in Labrador puppies. We’ll be looking at what happens in the different stages of teething so that you know what to expect. We’ll also look at what you can do to help this stage in your puppy’s development pass as peacefully and painlessly as possible. Let’s take a look inside a Labrador’s mouth and see just what there are in there. How many teeth do dogs have as adults? Labradors are lucky. Unlike some modern dogs breeds, they have a full sized jaw bone with plenty of room for their teeth. So, it’s unusual to see a Labrador with crowded teeth. Most adult labs have a beautifully designed set of forty-two teeth. This is a perfect mouthful for crushing bones and for ripping and tearing up meat! Just like people, dogs can have problems with their teeth. Tooth decay is common and teeth can get broken. We’ll look at that a bit more closely below. Occasionally, a Labrador will have one or more adult teeth missing. Usually this is one of the premolars that sit between the long canine tooth, and the big molars at the back of the mouth. How many teeth does a Labrador puppy have? Like human babies, Labrador puppies are born without teeth. And, like human babies the first set of (deciduous) baby teeth are lost during infancy. These are replaced by bigger, stronger grown up teeth. Labrador baby teeth don’t include molars. This means your puppy will only have twenty-eight teeth until he cuts his grown up ones. 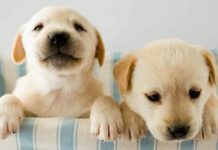 When do Labrador puppies start teething? That first stage in the teething process involves the cutting of the first teeth through the sealed gum. It’s what causes our own human babies a bit of trouble, but it doesn’t seem to worry puppies too much. In addition, this phase is pretty much over once you collect your puppy at eight weeks old. He’ll have cut his first teeth between three and six weeks of age, when he was still with his breeder and his brothers and sisters. So you won’t normally need to worry about that. Your puppy’s baby teeth will start to fall out at around four months of age. This part of the puppy teething process is actually the second ‘teething’ stage. At this stage your pup loses his baby teeth and replaces them with permanent grown up ones. Loss of baby teeth begins after the puppy is three months old. By four months you’ll probably notice that your puppy has some teeth missing. Apart from cute little toothy gaps in his mouth, you’ll probably notice your puppy chewing obsessively on anything he can put in his mouth. The chewing may help to relieve the discomfort in his gums, but you need to watch him carefully. Make sure he is not swallowing bits of blanket or toys that have come apart. Providing suitable chew toys is important and we’ll look at that in a moment. Some people claim that their puppies are more irritable during teething but I have not personally found this to be the case. How do puppies lose their teeth? The process of losing teeth occurs because your puppy’s body reabsorbs the roots that hold the baby teeth in place. Once the root is fully reabsorbed, the tooth becomes loose and is easily knocked out when the puppy eats or chews his toys. Because the root has been absorbed, teething probably doesn’t hurt your puppy very much. However, his gums may be a bit irritated or sore. Teething doesn’t seem to interfere with a puppy’s mood, his willingness to play, or his ability to sleep. You can now buy teething gels to put on a puppy’s gums during this time. But a word of caution before you rush out to buy some. Understandably, some people want to use puppy teething gels. While putting something on a puppy’s gums may not make a lot of difference to the puppy, it feels good to be doing something to help. However, we recommend you have a chat with your vet before using puppy teething gels. As opinions vary as to whether or not gels are effective or even harmful. There’s blood in my puppy’s mouth! Sometimes during teething, you’ll see a little trace of blood in your puppy’s mouth or on his toys. As long as it’s only a small quantity, this is perfectly normal. You might also come across a cracked tooth. This may need to be seen to by a vet to avoid the risk of infection. Infection can be quite painful. It simply means he has knocked one of his loose teeth out a bit roughly, before it was quite ready to fall out. Why can’t I find my puppy’s teeth? Most of the time, your puppy probably swallows his baby teeth along with his dinner, or while playing. You may occasionally find a baby tooth, which you can keep as a memento, but they are tiny and quite hard to spot! What are the best chew toys for teething puppies? Without doubt, the most useful toys you can buy your teething puppy are Kongs. You need to fill the hollow center with mushy food and freeze them. Your puppy can then spend up to half an hour of bliss removing the frozen contents. This soothes his mouth and relieves boredom (another common cause of chewing). You can buy lots of other chew toys but I find these to be the best. When will my puppy stop teething? 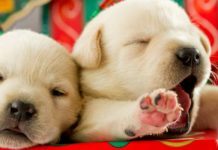 Many puppies will be done with teething by about seven months and almost all puppies will have a full set of adult teeth at eight months old. A lot of people think that this phase will signal the end of the puppy chewing phase, but this isn’t necessarily the case. This is because there are reasons other than teething for the enthusiastic chewing that so many Labradors seem to have. Check out this link to find out all about the causes (and cures) of destructive chewing. Does teething cause diarrhea or fevers? There are a great many claims for the effects of teething in children, from fevers to rashes and upset tummies. These claims, tend to be associated with that first stage in teething. In other words when the baby goes from no teeth at all, to a set of deciduous teeth. This stage is over in puppies before you bring your own puppy home. Over the next few months, your pup will lose his baby teeth and grow his adult replacements. This is the equivalent of what happens to older school-aged children, not what happens in human babies. In addition to this, there is little or no evidence to suggest that teething causes anything other than teeth in puppies. So if your puppy is unwell, don’t put it down to teething. It is really important not to delay veterinary attention to small puppies that are not well. A small, sick puppy can become seriously ill very quickly. Have a look at our ‘when to call your vet’ information. Don’t hesitate to ring your vet if you are at all worried about your puppy’s health. It is unlikely that teething alone will upset your puppy’s tummy or give him a fever. However, there are problems that puppies can have with their teeth. The first is to do with the structure of the jaw. The second is to do with the position of the teeth as they grow through the jaw. 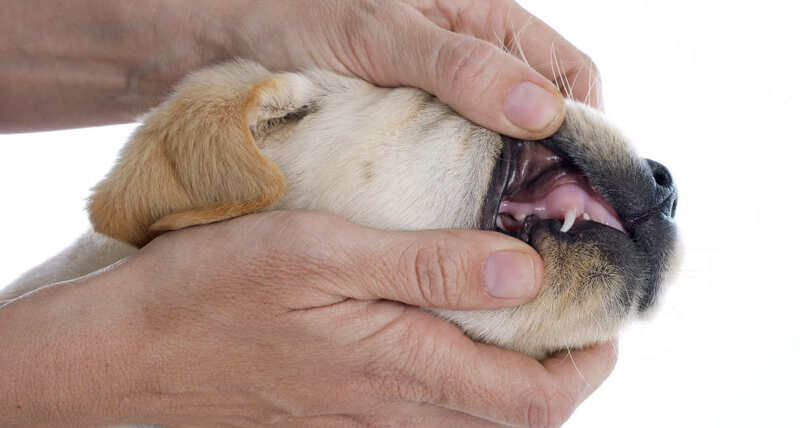 Your Labrador’s bottom teeth should fit snugly just behind his top teeth in what we call a ‘scissor bite’. 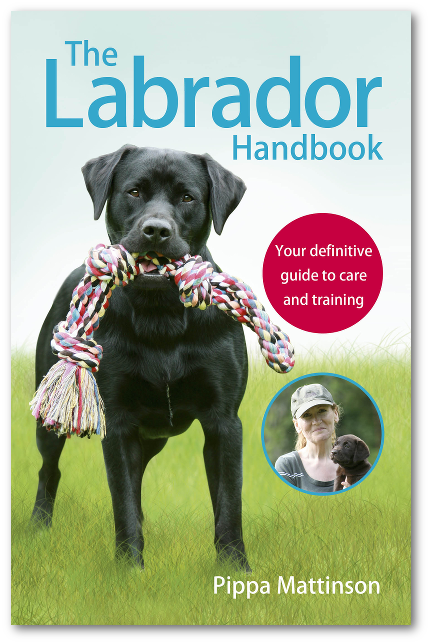 If you are looking for a puppy to raise as a working retriever, or for the show ring, this is something worth checking for. Occasionally you’ll find a puppy with a slight overbite. This isn’t a big issue health wise, as long as it isn’t so severe that the bottom teeth can scratch against the top palate. There are also other more unusual types of misalignment which you probably won’t come across. Sometimes teeth that look slightly misaligned will level out when the adult teeth come through, and vice versa. It isn’t always easy to tell. 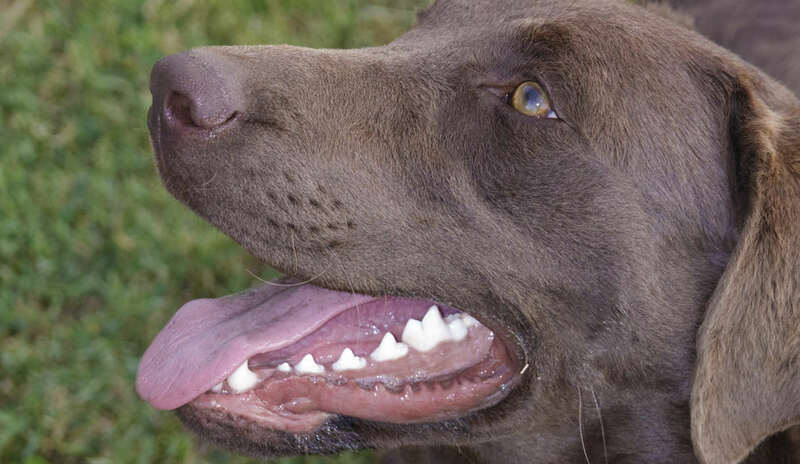 If you see brown plaque on your puppy’s teeth, or maybe very sore looking gums, this may be cause for concern. Periodontal Disease is a common and sometimes severe problem in dogs. Just like in human, dental hygiene is important in dogs! Sometimes, some of a puppy’s baby teeth stubbornly refuse to fall out. Have your puppy checked by your vet if you think he still has some deciduous teeth left in his mouth at six months old. Retained baby teeth can impede the growth of the adult teeth and cause problems for your puppy later on. Despite a lack of molars puppies still have powerful jaws and very sharp teeth. 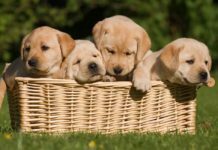 From an early age, puppies are learning to harness that power and not to use it when playing or interacting with other dogs and people. This is a process called bite inhibition. It’s a good idea to read up about this process as you need to work with your puppy to fine tune his bite in order to ensure he never harms anyone. 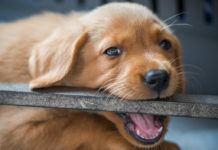 Puppies tend to bite a lot when they are teething. But the teething itself is not the only cause. Loosening teeth may irritate your puppy’s gums and he may chew and bite more during this stage to attempt to relieve the irritation. However, biting (and growling) is an important part of puppy play, that is often mistaken for aggression. Small puppies often bite too hard because the process of bite inhibition that we talked about earlier is not complete. They have learned how hard to bite their furry litter-mate and mother, but not how hard to bite on human skin. Teaching this is one of your roles. And it can be a painful time that you’ll be glad to see the end of. Let’s summarize the teething process now, by putting the stages into a timeline. A puppy that is fed a sensible and appropriate diet, and never given sugary food or drinks, is unlikely to suffer from tooth decay. But once his adult teeth come through, it is a different story. His permanent teeth have to last him the rest of his life. It’s up to you to take care of them. If you feed your dog anything other than a completely raw diet, you’ll probably need to clean his teeth for him. It’s a good idea to start this from a very early age, so that your puppy gets used to it and doesn’t struggle. You’ll find lots of information to help you and a useful video, on this page. Your puppy may need dental treatment at some point in his life. For example, he may break a tooth. Therefore, he must be happy to have his mouth examined. This is something you can start when he is really small. Get him used to having his lips lifted up, and his teeth examined now, using food as a reward. You’ll find it much harder if you leave it until he is older. Your puppy’s baby teeth are exchanged for adult ones during the first six month of life. Puppy teething can make biting worse, but your puppy also bites in play and he needs to learn to be gentle with his mouth. 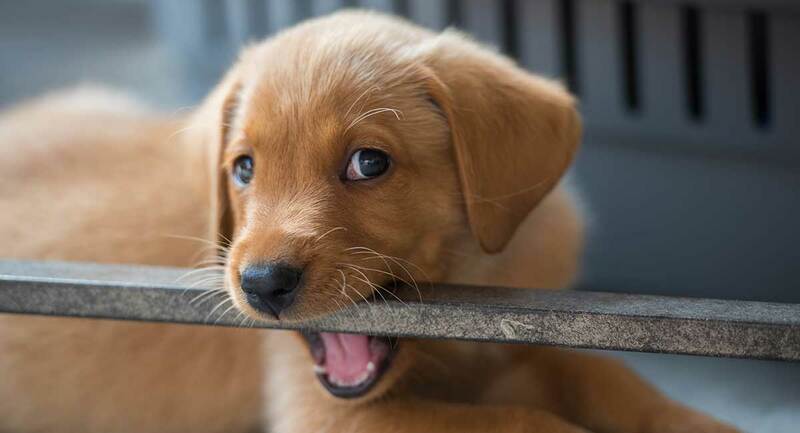 Chewing is also a natural behavior for teething puppies. It probably helps to relieve some of the discomfort in the puppy’s mouth. It also helps the puppy to shed those teeth that are loose and ready to come out. Chewing in Labradors is not restricted to the teething phase. 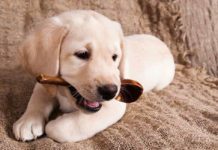 So, do check out our tips and advice on chew toys, on teaching your puppy what he can and can’t chew, and on stopping your puppy or young dog from chewing up your favorite things. 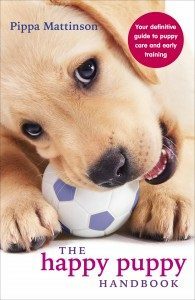 The book will help you prepare your home for the new arrival, and get your puppy off to a great start with potty training, socialization and early obedience. Hall, Lynne, Mcdonald, Sharon and Young, “Shell Barking Up the Wrong Tree: A Qualitative Study of the Potential for Dog-Owner Technology”. British HCI Conference. My 7month old black lab loves to chew…If it is on the floor it is in her mouth being chewed to smitherines It is my full time job keeping her safe if she can get a shoe and I don’t catch her it’s a goner….will this behavior end..have I failed somewhere…I scold her in the act and her tail is waggging a mile a minute…she knows i5 is wrong…she gets plenty of attention…right now can’t get much outdoor walking because of icy conditions or extreme temps. Hello my black boxer puppy is not eating anything today. What could be the reason? Anyone, please guide. I have a chocolate Labrador 4month old 95% of her is brilliant 5% trouble she races round at night like she’s demented doesn’t stop at doors etc doesn’t hear you end up having to put her out side. Also I give my puppy kibble for juniors up to 15kgs I don’t know if it’s the food but she has started with very loose poo. Any suggestions welcome. Hi. Our 5 month old yellow lab puppy appears to have a loose premolar. Quite abit of bleeding and pawing at his face. I’m guessing he loosened it before it was ready. Just checking that it is normal for labs to lose their premolars? Our 5 month old black lab isn’t a huge fan of cold things in her mouth. She likes ice cubes, but if we freeze a Kong with some PB or Pumpkin, she has no interest. Any other brilliant soothing ideas? She just seems so grumpy and I want to make her feel better! So much information, thank you guys. I was worried when I first saw blood in his mouth, he is almost 4 months old. I love this website! Everything I need to know or want to learn with my lab puppy, I find here. It’s a step-by-step process that matches exactly what my puppy is going through at any given time. My 10 week Labradors first tooth fell out . Is this normal at this age, it seems a bit young. What a helpful site… you don’t pull any punches .. or make promises. We have a 16 week old yellow lab.. chewing and jumping a problem.. other wise learning very quickly. Should he have raw hide? I have heard good and bad. thanks!! Thank you so much mam for helpful information? Thank you for the info I really needed this! I have a 3 month old english lab and this helps. Thank you for all your helpful information. I am 50 years old and got my first puppy ever and your website has be so valuable to me.